Their study focussed on the deteriorating social and moral atmosphere in society and on finding viable and practical solutions to remedy this worldwide phenomenon. The study covering boys and girls of 12 Indian schools was undertaken in two phases. In the first phase they identified the value system of teenagers with special focus on the values they lacked. As a result of this exercise, in the second phase they suggested certain exercises to build a strong sense of values in school going teenagers. The questionnaire they framed consisted of 196 questions and they contacted 12 schools from northern India. In all, responses of 256 girls and 252 boys were taken up for study and analysis from these 12 well-known schools located in (1) New Delhi, (2) Meerut, (3) Kanpur, (4) Lucknow, (5) Simla and (6) Jaipur, all major cities in northern India. The names of the schools are : (1) Sanskriti School, New Delhi, (2) Carmel Convent, Chanakyapuri, New Delhi, (3) Vasant Valley, New Delhi, (4) St. Thomas School, Meerut, (5) St. Mary's Academy, Meerut, (6) Central School, Kanpur (7) Seth Anandram Jaipuria School, Kanpur, (8) City Montessori School, Chowk, Lucknow, (9) City Montessori School, LDA, Lucknow, (10) Auckland House, Simla, (11) Mt. St. Mary's, New Delhi and (12) Children's Academy, Jaipur. Forty values were studied. Students of class IX (146) and class XII (152) were the subject of this study. (Please refer pages 21 to 34). The study classified virtues under the following headings: (1) self-discipline, (2) self-management, (3) humanity, (4) inquisitiveness, (5) self-control, (6) self-satisfaction and liberty. 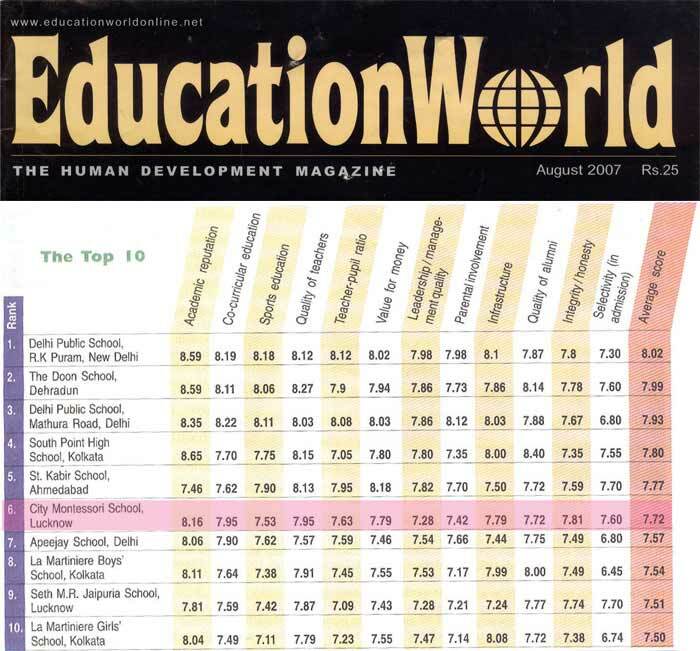 After Factor Classification and Cluster Analysis (pp 37 to 41) their study revealed the above mentioned for the City Montessori School, Lucknow (CMS). What do I want to accomplish through my education? Want to become rich and famous in order to serve others and the poor. Want simply to become rich and famous. Why did I choose to study at CMS? “CMS makes us glow in this morally dark world."